Antonio Vivaldi, violinist and composer, was born on March 4, 1678, in Venice, Italy and died on July 28,1741 in Vienna, Austria. He was nicknamed “the red priest” because of his red hair and the fact that he had been ordained as a priest at St. Mark’s Chapel in Venice in 1703. Because of poor health, he was excused from active service as a priest in 1704. Of the composers of the Baroque Period (1600-1750) in music, Vivaldi is most remembered for his concertos ‑ he wrote over 500! Most of his concertos were for the violin (The Four Seasons are but 4 of more than 230) but he also wrote concertos for other instruments, such as: viola (6), cello (27), mandolin (2), trumpet, oboe (17), bassoon (37) and, of course, the flute (16 - including 3 for Piccolo and 2 for Recorder). Although for almost 200 years after his death, Vivaldi’s music fell into virtual obscurity, his influence on the solo concerto was widespread. His use of three movements (fast, slow, fast) and ritornello form (a refrain, alternating with solo episodes) was copied and developed by his successors. Vivaldi only assigned opus numbers to his published works. In 1733, after Opus 12, he stated that he wasn’t going to publish any further because it interfered with the sale of his manuscripts (from which he received more money). The Il Pastor Fido, Op. 13 (“The Faithful Shepherd”) Flute Sonatas are considered spurious, constructed from parts of works by Vivaldi, in addition to Joseph Meck (1690-1758) and Giuseppe M. Alberti (1685-1751). The Alberti Bass pattern, used by Vivaldi and other Baroque and Classical composers is named for Domenico Alberti (1710-1740, no relation to Giuseppe), who was the first composer to employ it. Despite the fact that there are only 12 opus numbers, Vivaldi published more that 100 works, in that each “opus” contains multiple works, usually 12. Opus 10 is a collection of 6 Flute Concertos published in 1729-30 in Amsterdam ‑ the first flute concertos ever published. Four of the Opus 10 concertos were also given descriptive titles and/or nicknames. In conjunction with the Italian music publisher Ricordi’s publishing of a complete edition of Vivaldi’s music in 1947, Antonio Fanna organized the works into 16 volumes by instrumentation - the 6th volume (Fanna VI) contains 16 Flute Concertos - including 2 for Recorder and 3 for Piccolo (Flautino). A 17th Concerto (Fanna VI, No. 17) is now considered “doubtful”. French musicologist Marc Pincherle (1888-1974) published an extensive biography of Vivaldi the following year (1948, Vivaldi: Genius of the Baroque), and a numbered list of works. A more complete list was published in 1974 by Peter Ryom: Verzeichnis der Werke Antonio Vivaldis (A Catalogue of the Works of Antonio Vivaldi) which assigns each piece an “RV” (for “Ryom Verzeichnis”) number. With the possible exception of No. 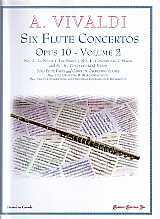 4, all of the Concertos of Opus 10 are based on earlier versions of concertos; all are for flute and strings. Although harpsichord would have undoubtedly been included in performance (realizing the figured bass part), its use has been kept to a minimum - only when necessary to help maintain harmony or rhythm. Unlike modern concertos, the flute usually plays in the tutti sections; to distinguish, cues (of tutti) are printed as smaller notes. Concerto in G Minor - La Notte (“The Night”) (F. VI, No. 13; RV 439) originally existed as RV 104, a Chamber Concerto (a concerto for a small group of solos instruments without orchestra) for flute (or violin), two violins & bassoon. Vivaldi also used the name La Notte (The Night) for one of his Bassoon Concertos (RV 501, in Bb major). In addition to the programmatic title La Notte (The Night), two of the movements also have descriptive titles: the 2nd movement - Fantasmi (phantoms) and the 5th movement - Il Sonno (sleep). The 5th movement is actually constructed of two sections from the 2nd movement of Autumn from The Four Seasons (Op. 8, No. 3, RV 293; measures 1-17 and 31-39, transposed down a tone, from D minor to C minor); the 2nd movement of Autumn in The Four Seasons also depicts sleep (sweet slumber). This concerto is unique in the Opus 10 concertos for several reasons: it is the only one in a Minor key; it has 6 movements, alternating Slow/Fast (all others are 3 movements - Fast/Slow/Fast); some movements have descriptive titles; and, it is the only concerto which has a movement without a solo section (the 5th movement). It is also probably the most difficult of the Opus 10 concertos because of the challenges of the 4th movement. Short introductions were added to three of the movements: 1st movement (1 bar); 2nd movement (1 bar) and 4th movement (2 bars). To ease practicing with the “complete” version of the MIDI accompaniment of the concerto, measure numbers run throughout the concerto from 1 to 199. Concerto in G Major (F. VI, No. 15; RV 435) is the only concerto of the six of Opus 10 for which there is no earlier version, or, at least to date, none has been found. To ease practicing with the “complete” version of the MIDI accompaniment of the concerto, measure numbers run throughout the concerto from 1 to 267 (the 2nd movement starts at measure 164 and the 3rd movement starts at measure 200). A short introduction (4 bars) has been added to the 1st movement; in addition, the meter has been changed from 3/8 to the meter of 3/4, and all of the note values have been doubled. To help maintain the feeling of the meter, Harpsichord has been used in the solo passages, playing on the 1st beat of the measure (28-48, 58-78, 107-119 and 123-140) or the 1st and 3rd beats (87-100). 2nd movement in this arrangement, all of the note values have been doubled - doubling the length of the movement (from 18 bars to 36). Harpsichord has been used in the solo sections, playing whole notes (on the 1st beat of the measure); in the first two solo entries (167 and 178), Harpsichord enters on the 3rd beat. 3rd Movement - a short introduction (3 1/2 beats) has been added to this movement. The feature of Vivaldi’s odd length phrases, not merely in the number of measures, but also in the number of beats, is evident in the movement - the phrases are often half measures in length, as if the piece were actually in the meter of 2/4 . Double barlines, therefore, cannot always be placed to separate the start and end of phrases. You must count carefully; what “feels” like the start of the measure (i.e., the start of the phrase) often shifts from the 1st beat to the 3rd beat of the measure (e.g., compare 200-204 and 253-257). Harpsichord has been employed playing half notes (on beats 1 and 3) in most solo sections. Concerto in G Major (F. VI, No. 16; RV 437) originally existed as RV 101, a Chamber Concerto (a concerto for a small group of solos instruments without orchestra) for recorder, oboe, violin & bassoon. Short introductions were added to each movement: 1st movement (1 bar); 2nd movement (2 bars) and 3rd movement (4 bars). To ease practicing with the “complete” version of the MIDI accompaniment of the concerto, measure numbers run throughout the concerto from 1 to 243 (the 2nd movement starts at measure 110 and, taking into account the repeats in the 2nd movement, the 3rd movement starts at measure 144). The theme from the 2nd Movement is used again in the 3rd movement, transformed to major - a rare example of thematic continuity within a Baroque work.